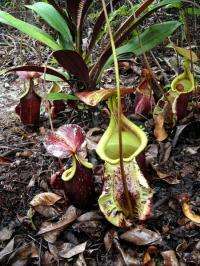 (PhysOrg.com) -- The pitcher plants are carnivorous species that usually feed on insects and small vertebrates, but one species has been found that prefers to dine on the feces of bats. Scientists from the University Brunei Darussalam and from Germany have been studying the aerial pitcher plant Nepenthes rafflesiana variety elongata, from Borneo. The plants live in peat bogs and heaths and are notable for their extremely large aerial pitchers. Pitcher plants grow on nutrient-poor soils and supplement their nitrogen source by feeding on insects and small animals. The victims are attracted to the pitcher by its colors and smells, but once inside they are trapped on the slippery sides and are drawn into the fluid at the bottom where they drown. The fluid contains digestive enzymes to extract nitrogen and other needed nutrients as the bodies are digested. N. r. elongata differs from other pitchers in having a much larger (around 4 x) pitcher than related species, but it traps only around one seventh of the insects consumed by other pitcher species. The researchers found Elongata had low volumes of digestive fluids and enzymes and low amounts of the insect-attracting volatile compounds usually found in pitchers, which makes them less attractive to insects. Instead of insects in the large pitchers, the researchers, led by tropical ecologist Dr. Ulmar Grafe, sometimes found roosting bats. Dr. Grafe spent a year inspecting 400 Elongata plants and found 32 bats in that time, among them a whole family of offspring and young nestled in a single pitcher. Some of the tiny (4 g) bats, all Hardwickes woolly bats (Kerivoula hardwickii hardwickii), were fitted with radio-trackers, and the results of tracking indicated they roosted only in the pitchers. The Elongata pitchers are perfectly suited to their residents, with a girdle half-way up to ensure they do not slip down the sides, and there is little fluid and so no chance of being drowned if they did slip. The researchers found that about 33.8 percent of the foliar nitrogen in the pitcher plants originated in the feces of the bats, and the level of nitrogen was much higher than in pitchers of the same species that did not have a resident bat. The association between the pitcher and bat is only the second case of a mutualistic association between a pitcher plant and a mammal (the other being a tree shrew), and is the first case of a pitcher that attracts bats to roost in its aerial pitchers and use their droppings as a source of food. The bat also benefits from the association because it is sheltered and hidden from predators when it is nestled within the pitcher. Dr. Grafe said the environment within the pitcher is also free of the parasites that often live in bat roosts. The paper is available online at the Biology Letters journal.